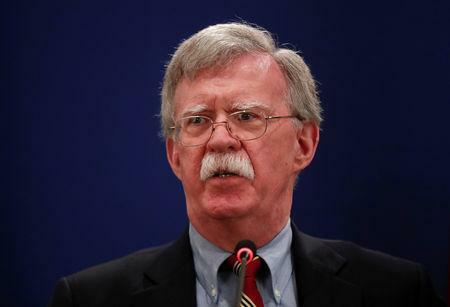 WASHINGTON (Reuters) - U.S. national security adviser John Bolton said on Wednesday the Trump administration wants sanctions on Iran's crude exports to strain Tehran, but does not want to harm countries that depend on the oil. The United States is preparing to impose the new sanctions on Iran's oil industry after Washington withdrew from a nuclear deal between Tehran and other global powers earlier this year, but is also considering offering waivers to some allies that rely on Iranian supplies. "We want to achieve maximum pressure but we don't want to harm friends and allies either," Bolton said in a talk at the Hamilton Society. Bolton said the administration understands that a number of countries, some close geographically to Iran which he visited last week, and others "may not be able to go all the way, all the way to zero immediately." It was a more conciliatory tone about the sanctions from Bolton, a proponent of being tough on Iran and winding down its crude exports to zero. Still, Bolton said that consequences can already be seen in Iran including the collapse of the rial, its currency. "I think it's important that we not relax in the effort," he said. Under the law, the U.S. president must periodically issue a "determination" on whether there is sufficient supply in the market from non-Iranian sources for countries to significantly cut their Iranian purchases. The administration's renewed sanctions are set to come into effect on Nov. 5. Under U.S. law, Washington can sanction the financial institutions of foreign countries that fail to significantly reduce their purchases of Iranian oil and petroleum products. Three of Iran's five largest buyers of crude - China, India and Turkey - have resisted calls by Washington to end their oil purchases outright. This week South Korea asked Secretary of State Mike Pompeo for "maximum flexibility" on its request for a waiver to prevent companies there from being hit by the sanctions. Other countries, including Iraq and Afghanistan, depend on some imports from Iran.